This Citroen XM Exclusive caught our jet-lagged eye on our way down to the river, where we also caught a glimpse of das boot. 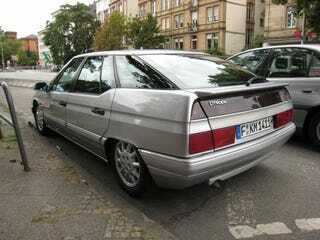 The 5-door XM packed a 3.0L 24-Valve DOHC V-6 or 2.5 TD turbo set atop Citroen's signature nitrogen springing - also known as Hydractive suspension. The computer-controlled liquid suspension has a compliance six times greater than suspensions made of schteel, and is driver adjustable. Had things gone better for this descendant of the mighty Citroen DS, a great deal more mechanics would be troubleshooting hydraulics instead of replacing the occasional strut. We're still looking for a good frankfurter.